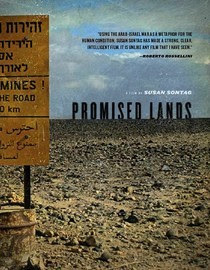 "You can’t fight only because someone told you to fight, you know, you have to fight because you know we can’t lose” –Those are the words of an Israeli soldier deployed in the south of the country near the end of the Arab-Israeli war which is the central theme of “Promised Lands”; a documentary film made in Israel in 1973 and released a year later to critical acclaim of a few aficionados and cinema lovers who found in it that power of the visual essay that was many decades ahead of its time. You ask yourself now: Is this a scripted line? Is it the answer to a question? And this must be asked because one can never be sure whether it is a documentary or some kind of literary nonfiction for the screen; but we do know that the images are real and it is nothing but the careful ensemble what creates this particular effect on the viewer. If it was the answer to a question, what was the question then? The question here is of the visual kind: the barren land from the desert adorned with scorched bodies over which flies are hovering, contrasted to the comradeship of soldiers in the trenches of war; the glamor of military honors at the Jerusalem War Cemetery, contrasted with the hysterical wailing of Moroccan women during the funeral of a young soldier; the official history of the state told through a visit to the wax museum, contrasted with an acute examination of Jewish consciousness; fragments read out of anti-Semitic pamphlets from the school curriculum of Syria, Egypt and Jordan, contrasted with silent images from Palestinians and Israeli soldiers at a checkpoint anywhere. As it is often the case with images – photographs, paintings, films or even mere memories – they can redeem the subject and offer an alternative to reality, but they are neither questions nor answers and function more like the kind of random questions asked by children – that either do not require an answer or can only lead to newer questions in a circular sequence. Images can console, stir up, excite, provoke, but they carry none of the meanings usually associated with arguments and explanations. The film, directed by Susan Sontag, whose film career has resisted the celebrity status associated with her writing, has little or nothing to do with the kind of films made by writers – such as screen adaptations of their own prose work; the obsession with images overrides not only the narrative quality of storylines but also the rules of the documentary: there’s no criticism, agendas, messages, interviews, dialogues or even a point of view to be offered. The visual element is not predominant but total; what Artaud called once pure or abstract cinema. The genre of the documentary is seriously defeated in this film, advancing a kind of visual aesthetics that might resonate today in that art form known as the installation or in certain styles of short and art film but hardly the case with documentaries; perhaps with the sole exception of the late Tim Hetherington who was himself, also the adopted child of many promised lands, that is, of promised lands without any promises. After it was banned in Israel at the time for portraying the country negatively according to government opinion – even though it would seem so mild today – and being overshadowed by Sontag’s celebrity status as a writer, essayist and public intellectual; the film was re-issued in 2011 and released on DVD the same week that Suzanne Mubarak prostrated herself at the presidential palace and wept inconsolable about her inevitable departure from the villa, moment that would separate one era of history from another. There is probably no connection between Suzanne Mubarak and Susan Sontag other than a land and the failure to deliver on a promise: Just like the departure of Mubarak from her villa failed to substantiate the promise of freedom delivered by the revolution, so did Sontag in her film fail to promise anything at all and the land promised in it, resembles more an anxious hope in an open sea than a dry land somewhere. It is strange that a filmmaker who had done previously fiction films says that her one documentary is her most personal film; she appears nowhere in the film either in person or as a voiceover narrator, and all of the tropes often found not without alacrity, in her writing, are entirely absent here. But there is a relation to the material found in the footage both in the general and the particular sense – On the one hand the direct confrontation with the horrors of war and human conflict without a need to moralize them; on the other hand, it might have been the one and only opportunity in which Sontag dealt with the topic of her own estranged Jewishness and the crucial relationship to the State of Israel. Central to the film is a conversation between two Israelis: Yoram Kaniuk, a writer and defender of Palestinian rights and Yuval Neeman, a physicist who pioneered Israel’s nuclear technology program. The conversation in fact never happened but it is created in the film through monologues in which they address the camera not without a certain shy coolness and that is yet, a nervous intervention sewn into the images as it becomes perceptible that they are making up their minds about what they are going to say. Neeman espouses the view that the Arabs – Palestinians and otherwise – are committed to the task of exterminating the Jewish state and that they view it as something temporary just like the Crusaders from Europe were ultimately expelled; what is really not entirely out of touch with the reality of the Middle East in which the word Zionist is constantly used to refer not only to each and every inhabitant of the Jewish state but also to a European invader. He then says, not without certain cockiness, that he would like Israel to be more like Andalus – a territory forever lost to the Muslim conquest – and less like the Crusaders. Kaniuk on the other hand is perhaps the most enriching part of the entire film and not because of what he has to say, but because of the stark contrast between the images of war and the incisive and introspective melancholy and hesitation made manifest in his interventions: He reflects upon the Israeli-Arab wars explaining to the viewer – without ever facing the camera directly – that whenever Nasser and Sadat threatened the existence of the young state, the same people who had come to Israel because it was the answer to Auschwitz, had seen in the same Arab attempts to eradicate the state, Auschwitz once again. But he doesn’t stop there. He goes on to explain in detail why the whole phenomenon of Jewish existence and of Israel in particular is nothing short of a paradox; and that there is something of a false Messianism in the alternative offered by Zionism to repair the paradoxical nature of Jewish history. In a humorous manner, he says that no matter how rational, Western, educated and enlightened are many of the Jews who came to the land of Israel, there is something absolutely irrational about going back to a land a few thousand years later and claim it as their own. But to be sure, this isn’t an attempt to delegitimize the state or the right of the Jewish people to occupy the land. In a beautiful metaphor he says how the Jews and the Arabs have never understood the meaning of tragedy – in which there are two opposing forces, one heroic and beyond the world and one evil and of this world – but only dramas, and poses the question that tragedy in the Greek sense occurs not even once in the Biblical narratives. What he is saying is that the drama of Israelis and Palestinians is that one right is opposed to another right. In what is probably the most significant narrative passage in the film, he says: “But the Jews have a right too. Don’t ask me why. But they have. Maybe. Where should we go?” and concludes by saying that in tragedy, such as in Shakespeare, everything gets solved when everybody gets killed in the end; but as far as Israelis and Palestinians, there is no solution. One can only wonder if today we are not headed for anything but Shakespearean solution? Kaniuk argues how both peoples have come to a point of all or nothing, in which it’s either reclaiming all the land for Palestinians or occupying all the land for Israelis. The stark contrasts presented through these conversations is translated into images captured almost accidentally: The processions of Christians along the Via Dolorosa in the Old City of Jerusalem juxtaposed to posters of scantily dressed women half destroyed by bullets and still hanging lazy from the same ancient walls; or the signposts in a street in central Jerusalem that lead to the left toward the Street of the Prophets and to the right to the Street of the Paratroopers. The history of Israel and Palestine; one of joy and pain, happiness and gloom, victory and defeat, right and wrong, tragedy and salvation, at all once, and usually at the same time and in the same place. Nevertheless, a common history.